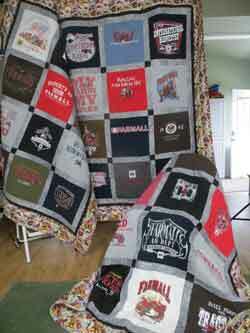 There are three categories for hanging or displaying your T-Shirt Quilt. Temporary, Semi-Permanent and Permanent. I think the terms are self-explanatory, but lets take a look at some creative options for displaying your t-shirt quilt. Several reasons why you might want to hang a quilt for a short amount of time. A surprise party, anniversary celebration, graduation party, shower, or just to get a photograph are ideas that come to mind. You want a quick and easy way to display the quilt that does not harm the quilt or the walls. Below are some ideas and images of some possible ways to hang your quilt. Here at T-Shirt Quilts of Texas, we have a Savage Photo Stand that we use to take our photos. We use cafe curtain clips on the rod, and can quickly hang a quilt, take photos, and then move on. 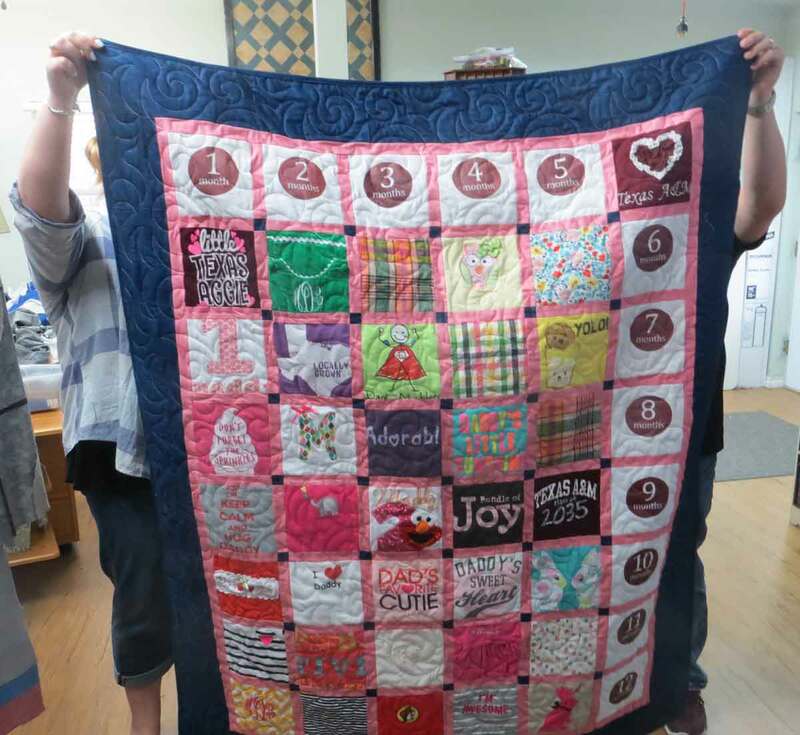 Sometimes, we will have a customer quilt hanging from the stand when they were due to arrive to pick it up! Straight pins. OK, the quilter side of me cringes at the thought of using pins to hang a quilt. But --- I have done it. I'm not proud... Keep in mind that using pins or thumbtacks can create holes in your quilt. Your option though. Of course to use this method, there needs to be a staircase or balcony. Just drape the quilt over the railing (or have someone hold the quilt if going for a photo) If going for the permanent method try not to have sunlight shining directly on the quilt. (Sunlight can bleach the color out of the quilt). How cool. If you have a vintage ladder to use it to display one or more quilts. I have an oak ladder in the shop that leans against the wall, with several quilts folded on it. Just drape across the arm or back, making it great to look at and easy to pull over your legs if you want. This is a special shelf that is permanently attached to a wall. Usually a dowel rod is incorporated to drape the quilt. (TIP: If the wood is newly painted or stained, put an old pillowcase between the wood and quilt to protect the quilt). Ask your quilter to add a hanging sleeve or loops to the back of the quilt and then run a curtain rod through it and hang it like a curtain. This is how we display quilts at our quilt shows, and works great at home as well. Command Hooks are great for hanging quilts. They attach to walls, and can be removed with no nail holes or other marks. Make sure you get the appropriate size for the weight of the quilt. The Hang it dang it quilt hanger slides into a sleeve sewn onto the back of your quilt. The hanger bracket snaps onto the hanger rod over top of the sleeve. Hang your quilt on the wall using one nail in the center. By using only one hanger bracket attached to the center of the hang it dang it quilt hanger, your quilt will balance itself naturally. So there are lots of ways to hang your t-shirt quilt. You can spend a lot or nothing at all.